The number of clicks and screens that are required to create an application and roster a player in Cal North’s Data Management System has drastically been reduced. With this new enhancement to the internal player registration process, registrars can register a returning player, and assign the player to a team all on one screen. 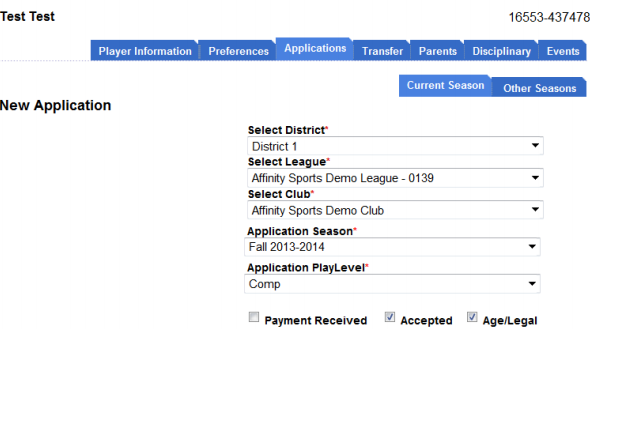 The internal application creation screen will now allow you to mark a player as Accepted & Age/Legal, and add the player directly to any qualified, non-activated team. This mimics the process of adding a new player internally through the add player/admin functionality. This is an optional feature and applications can still be created without using this new tool. Please Note: In order to add the player to a team you must check the Accepted and Age/Legal check boxes. Marking the player as “Paid” is an optional feature.